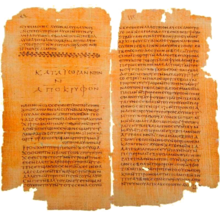 Nag Hammadi Codex II (designated by siglum CG II) is a papyrus codex with a collection of early Christian Gnostic texts in Coptic (Sahidic dialect). The manuscript has survived in nearly perfect condition. The codex is dated to the 4th century. It is the only complete manuscript from antiquity with the text of the Gospel of Thomas. The Book of Thomas the Contender. The text is written in uncial letters. It is well written in an informal book hand. There is no punctuation, no division between sayings. The nomina sacra are contracted in a usual way, the words at the end of each line are abbreviated and it uses ligatures, including staurograms. The manuscript was written by two scribes (A and B). Scribe B copied only the first 8 lines of page 47 and is not otherwise represented in the Nag Hammadi collection. Scribe A copied all leaves except the 8 lines on page 47, employed several styles, and left some blank pages because the text from which he copied was imperfect or illegible (probably). Scribe A is identical with the scribe of Codex XIII. It was discovered in 1945 at Nag Hammadi. It was first published in a photographic edition in 1956. The leaves of the codex were separated in 1957 and rejoined in 1974–1975. On June 8, 1952 the Coptic Museum received the codex. Currently the manuscript is housed at the Department of manuscripts of the Coptic Museum (Inv. 10544) in Cairo. ^ Plisch, Uwe-Karsten (2007). Das Thomasevangelium. Originaltext mit Kommentar. Stuttgart: Deutsche Bibelgesellschaft. p. 9. ISBN 3-438-05128-1. ^ Plisch, Uwe-Karsten (2007). Das Thomasevangelium. Originaltext mit Kommentar. Stuttgart: Deutsche Bibelgesellschaft. p. 11. ISBN 3-438-05128-1. ^ a b c Bentley Layton, Nag Hammadi codex II, 2–7: together with XIII, 2*, Brit. Lib. Or.4926(1), and P.OXY. 1, 654, 655 : with contributions by many scholars, BRILL, 1989, p. 2. ^ Bentley Layton, Nag Hammadi codex II, 2–7: together with XIII, 2*, Brit. Lib. Or.4926(1), and P.OXY. 1, 654, 655 : with contributions by many scholars, BRILL, 1989, p. 3. ^ Bentley Layton, Nag Hammadi codex II, 2–7: together with XIII, 2*, Brit. Lib. Or.4926(1), and P.OXY. 1, 654, 655 : with contributions by many scholars, BRILL, 1989, p. 5. ^ Bentley Layton, Nag Hammadi codex II, 2–7: together with XIII, 2*, Brit. Lib. Or.4926(1), and P.OXY. 1, 654, 655 : with contributions by many scholars, BRILL, 1989, p. 4. Bentley Layton, Nag Hammadi codex II, 2–7: together with XIII, 2*, Brit. Lib. Or.4926(1), and P.OXY. 1, 654, 655 : with contributions by many scholars, BRILL, 1989. This page was last edited on 13 February 2018, at 17:19 (UTC).